A new paper that explains how NFC-enabled sensors can be used to deliver service improvements in “hundreds of applications in many market sectors” is now available to download from the NFC World+ Knowledge Centre. NFC-enabled sensors are small, cheap and easy to use, the paper explains, and can use energy harvesting technology so that no external power source is required. Potential use cases range from a blood sugar monitor that can be implanted under a diabetic’s skin and then read at any time by holding an NFC phone or tablet over it to a variety of building and supply chain management, remote metering and process control applications. “New integrated NFC tag/sensor devices: How low-cost, low-power RF technology enables new applications” has been written by Oluf Alminde, a senior product marketer at chip maker AMS and a 15-year veteran of the wireless and RFID semiconductor industry. 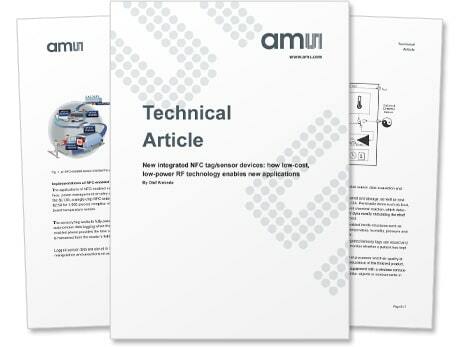 Download this technical paper and you will learn how NFC-enabled sensors work, understand the operational options available and discover the reasons why, for relatively low data-rate and short-range applications, NFC is a very attractive technology. You can access this technical paper here.